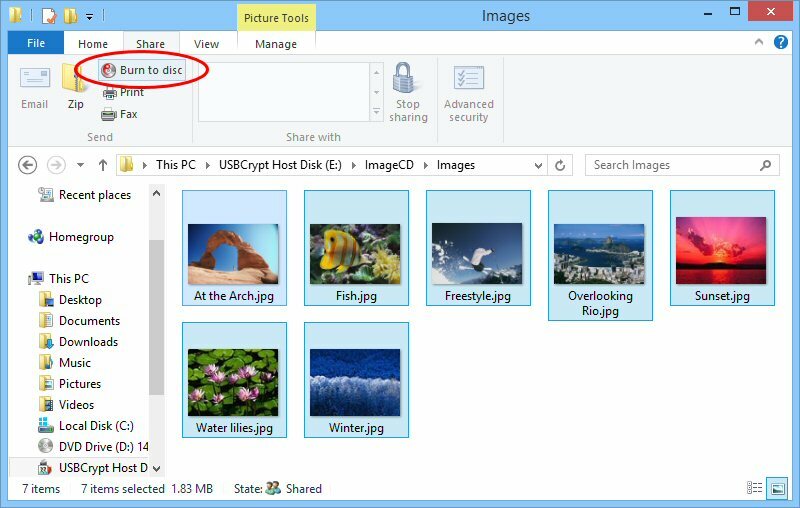 There are so many ways to share photos online these days, but wouldn't it be nice to save a collection of images on a recordable CD, to be able to use the CD on a moment's notice to showcase your latest vacation photos when your friends stop by for a visit? Ideally, you probably want the CD to start a slide show of the photos automatically when you insert it into the computer, because who has time to fiddle with the computer controls while you are discussing your last vacation with the friends, right? 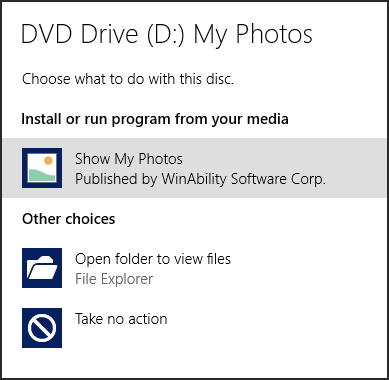 The label directive lets us specify the text that Windows should use when prompting you what to do with the disc. The action directive lets us provide the text of the action on the Windows prompt. Finally, the open and shellexecute directives specify the file we want to open: Windows will launch the default application to open the file, which most probably display the image on the screen. In this example we decided to start with Fish.jpg, but you can specify another file, of course. This should work well enough if the default application associated with the JPG files on your computer is the photo viewing application: if you select Show Photos from this menu (it could be another text, depending on the action directive in the autorun.inf file), it should launch the photo viewer and open the Fish.jpg file. However, what if you have another application set up to open the JPG files by default, such as PhotoShop? Or, if your friend is too busy to watch the photos right now, but offers to borrow the CD to watch it at home, who knows what kind of software is set up on your friend's computer to open the JPG files? 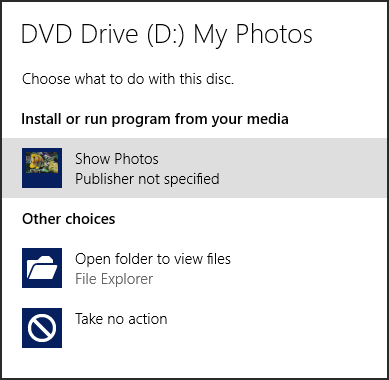 Is there a way to make sure that the Photo viewer is launched to view the image on the CD, and not some other graphics application? That's where our freeware utility PhotoLauncher comes in. 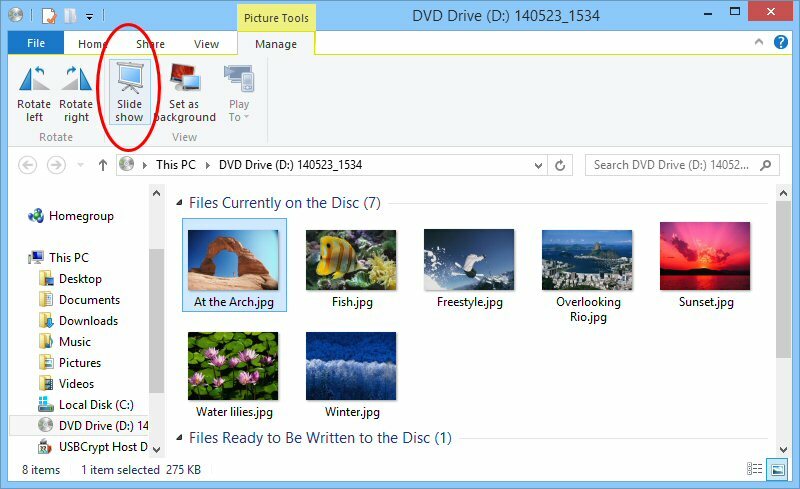 We've designed it so that when it starts, it launches the built-in Windows photo viewer to display an image file from the CD. Moreover, after launching the photo viewer, it also automatically turns on the slide show mode. Think how many mouse clicks and other trouble this can save! If you select Show My Photos from this menu, PhotoLauncher will start and it in turn will locate and launch the default Windows Photo Viewer to display the first image you've specified, and also switch the slide show mode on (unless you have disabled it, of course). Exactly what we wanted! OK, this works with Windows PCs, but what about Macs, Linux, and other computers? Sorry, PhotoLauncher will not work with them. However, you should be able to launch the photo viewer manually and make it display the photos from the CD that way.